See the uncanny similarity between the cheese and our bones? Cheese, a rich source of calcium, is vital for strong bones and reducing the risks of osteoporosis as we grow older. This is why we should ensure enough calcium intake during our childhood. The Columbia University in New York found in a study that teens who ate an extra two slices of cheddar a day (800 – 1200mg/day) boosted their bone density by 6%. Ready for baby pitter-patter round the house? Ask your man to eat more bean sprouts! Studies have shown that a male body needs a good supply of Vitamin C to make large quantities of sperm. Just half a cup of bean sprouts provides 16% the recommended daily allowance of Vitamin C for a man! 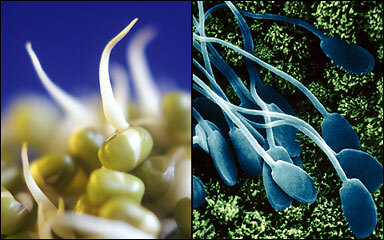 Better yet, bean sprouts are packed with folate, a vitamin that prevents defects in babies. Spot the resemblance? Eating lots of fresh fruits, such as grapes, have been found to reduce the risk of lung cancer and emphysema, a lung disease. 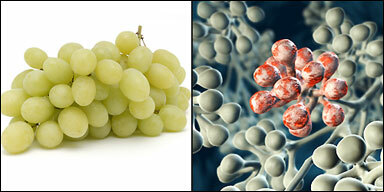 Grape seeds are also able to reduce the severity of asthma triggered by allergy. 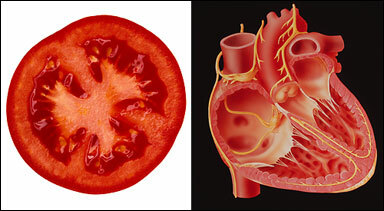 Akin to our heart, a tomato is also red and has four chambers. Tomatoes contain high levels of lycopene, a plant chemical that reduces the risk of heart disease and several cancers. The Women’s Health Study, an American research programme involving 40,000 women, found that women with high levels of lycopene in their blood had 30% less heart disease than women with lower levels of lycopene. Studies have also shown that lycopene reduces unhealthy cholesterol in the body and prevented coronary heart disease. An American study has found that walnut could prevent dementia and the Alzheimer’s disease. Research has also shown that the nut reversed signs of brain ageing in rats.